When it comes to appliances, Viking’s mission statement is clear. Viking tires to meld the power and functionality of professional appliances with the convenience modern consumers expect. This unique take has made them a staple in the oven and stove market. Viking appliances might be more expensive than the competition, but they come with a great blend of features for the more serious chef. As far as cookware is concerned, Viking’s choices are hardly any different. While it’s a bit more subtle, the pots and pans in Viking’s cookware lines have the same blend of professional power and convenient features that make their stoves so great. Their multi-ply cookware lines give consumers an excellent midrange option that easily competes with brands like Cuisinart, Kirkland, and All-Clad. This 3-ply line is a top contender for anyone looking for a midrange multi-clad set at affordable price. If you want a durable cookware set that’s built to last, this one is definitely worth a close look. If you’re after a frying pan to test out the quality of the brand, this one is probably the piece to choose. For those of you who aren’t ready to spend that much on a non-stick pan, consider this “everyday” pan. 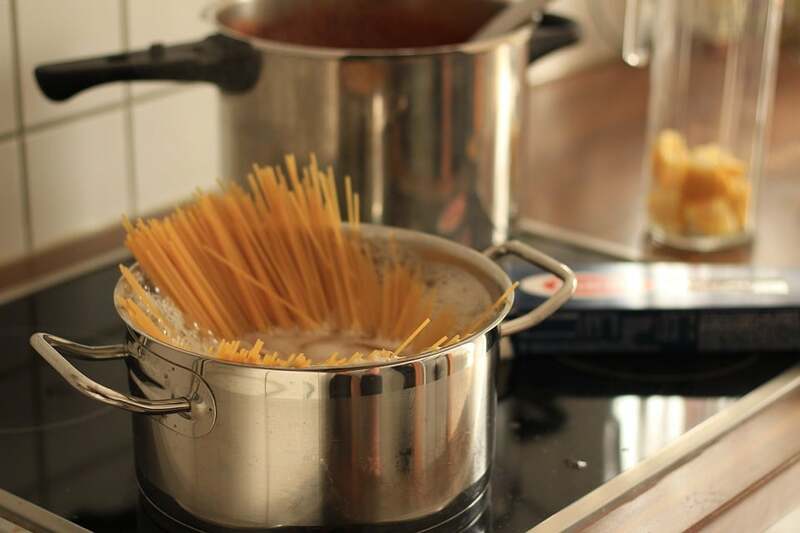 You get a steamer and a pasta strainer to make cooking your favorite dishes a little bit easier. This is one of the best ways you can take advantage of induction’s fantastic heat control. 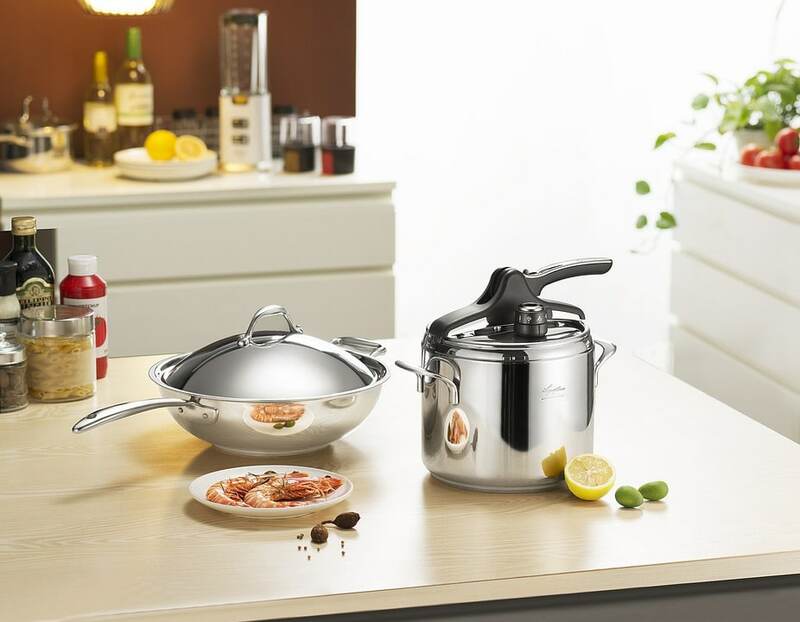 Еhis induction-compatible pot is perfect for anyone who owns a range or hot plate. So what makes Viking’s cookware so great? Let’s start by looking at this 3-ply stainless set. While it shares many features with other basic multi-ply offerings, this Viking cookware set has a few careful design decisions that help to set it apart. Just like with any other multi-ply cookware set, the first thing to understand is the construction. Viking uses the standard combination of a magnetic steel exterior, aluminum core, and stainless steel interior that makes 3-ply cookware so great. 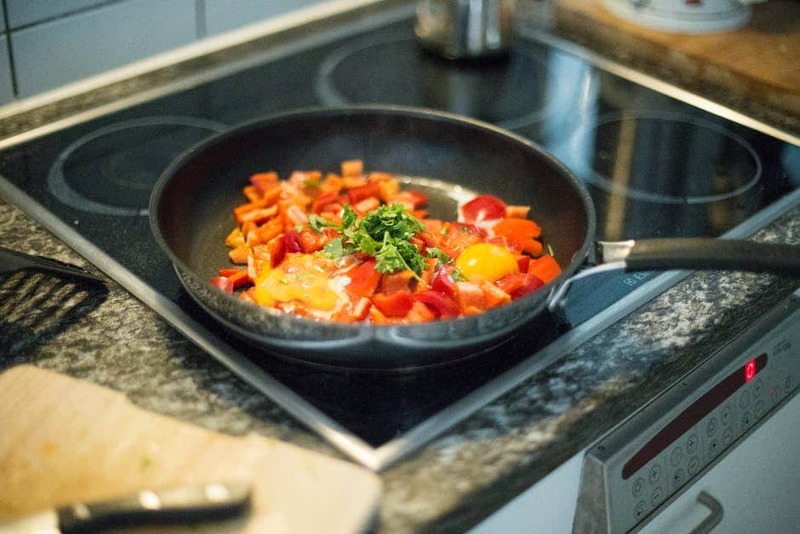 This combination of materials helps the cookware heat up quickly, lets it work on induction cooktops, and ensures that you’ve got a durable cooking surface that will work with any type of food. All-metal Viking pans like these will last for years, if not decades. 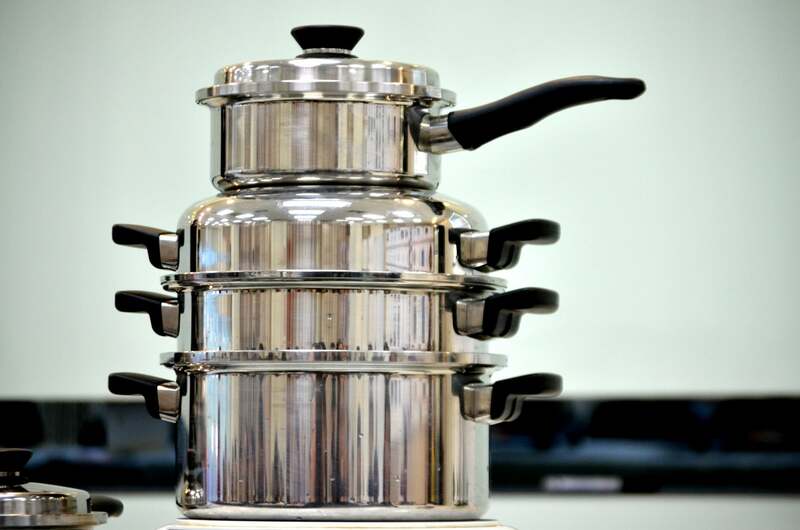 The strong steel will resist corrosion and scratches, while the solid construction ensures that the pots and pans won’t bend, break, or crack. In order to help seal in heat, this set comes with tempered glass lids that let you see what’s going on while you cook. All of the handles in this set are made of steel, keeping them easy to clean and reducing the chance that they’ll break. The pots, pans, and handles are oven safe to 500 F, while the lids have a lower max temperature of 450 F.
One of the more interesting convenience features appears in the inside of any pot or pan that’s designed to cook liquids. Viking has included a set of interior markings that let you know how much liquid is in the pan. This helps to reduce the number of measuring vessels you need to use to prepare many recipes and lets you accurately judge how much liquid leaves your dishes as steam. The riveted handles on this set are quite reminiscent of the handles on Kirkland’s multi-clad line. Their bold bases make solid contact with each pot and pan, while the durable rivets mean that you won’t ever have to tighten a screw to keep your handle on tight. This comes with a slight downside, however, since you’ll have to clean around the un-removable rivets every once in a while. For most users, however, this isn’t too big of a deal. The pieces included in this set are slightly different than the items you’d normally receive in a 10-piece set. Notably, there’s a saucier pan included instead of a larger frying pan. This is a bit of specialty cookware that has large, sloped sides that help you reduce liquid out of a sauce by increasing the surface area of the pan. It’s a thoughtful touch that makes this set more appealing to serious chefs. While the stainless steel cooking surface of this set is incredibly durable, it’s worth noting that it’s not non-stick. Viking makes a few non-stick lines, but this set is not one of them. You’ll need to use a combination of cooking fat, temperature control, and care to keep food from sticking. 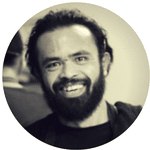 You’ll be able to fry eggs and cook meat with no problem as long as you use all three. If you forget them, however, you’ll wind up with a sticky mess. It’s usually not too bad to clean things up with some soap, water, and elbow grease, but it’s definitely a lot harder than cleaning up a non-stick pan. One small downside of this set is how quickly it reacts to temperature changes. I’m personally a big fan of 3-ply cookware over 5-ply, but it does have the downside of being somewhat more touchy when it comes to controlling the exact temperature of your pan. If you’re less confident in your ability to manipulate your burner flame (or dial), consider the Viking Professional cookware set below. It’s got a couple extra layers of metal that smooth out its temperature response and help retain heat in the pan. Overall, this 3-ply Viking line is a top contender for anyone looking for a midrange multi-clad set. It’s priced somewhat reasonably, has a great selection of pieces in the box, and has a couple extra features that make it more convenient to use than competing sets. If you want a cookware set that’s built to last, this Viking cookware set is definitely worth a close look. My love of Viking stems from their ability to blend convenience with functionality. This Professional 5-ply set steps things up a notch when it comes to raw power. It’s got more oven safety and more layers of metal, meaning that it’s easier to control the temperature of your pots and pans. If you don’t mind spending a few extra dollars, this cookware set is a solid upgrade over the 3-ply set above. Unlike the 3-ply set above, this Viking cookware set is oven safe to a full 600 F. This includes both the pots, the pans, and the metal lids that come with the set. If you want a line of cookware that you can stick below a commercial broiler, this is definitely one of your best options. The other major difference comes in the number of layers used in the bonded construction of these pots and pans. While the 3-ply set above goes steel – aluminum – steel, this 5-ply set utilizes a steel-aluminum – steel – aluminum – steel sandwich to make up the base and walls of each pot and pan. The extra layers help ensure that heat spreads evenly throughout each pot and pan and give your cookware a bit more thermal “weight.” This means the pots and pans retain a bit more heat after you turn off the burner. The Professional line still includes several of the convenience features of the 3-ply line above, including interior volume markings and extra long stay-cool handles. The handles are still riveted and still a bit of a pain to clean, although again, this isn’t a giant issue in most kitchens. As far as downsides go, this set has only one major issue: it’s expensive. For some households, it’s tough or downright impossible to justify the purchase of a cookware set this expensive. That’s totally fine. There’s nothing wrong with choosing the cheaper 3-ply set above or considering brands like Kirkland or Cuisinart instead. If you do have the money, however, justifying this cookware set is pretty easy. It’ll last a really, really long time due to the high-quality all-metal construction, and it’s even backed by a limited lifetime warranty. 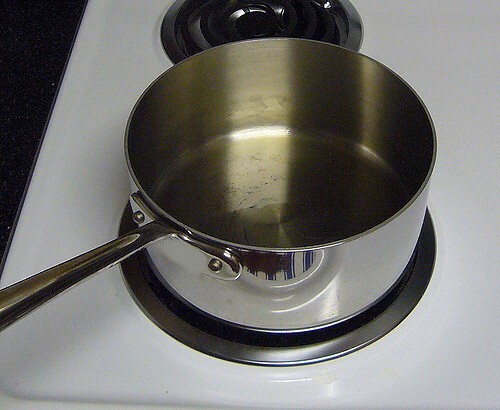 This means that you’re not likely to replace your cookware set anytime in the near future. While the up-front cost is pretty large, your cost per year for the lifetime of this cookware set is likely to be quite low. As long as you can afford it, this 5-ply Viking Professional cookware set is a great option that rivals expensive sets from brands like All-Clad, Demeyere, and Zwilling. It’s got a solid mix of features, quality, and durability. If you’re after a Viking frying pan to test out the quality of their professional line, this frying pan is probably the piece to choose. It’s not quite as voluminous as a straight-sided saute pan, of course, but the big base and the included lid give you plenty of freedom to try different styles of cooking while you put this dish through its paces. There’s a big difference between this frying pan and the cookware set above, however, since this pan is non-stick. That said, the durable coating that Viking has chosen will give you a bit of extra durability that will help extend the life of this frying pan. For those of you who aren’t ready to spend quite that much on a non-stick frying pan, consider this stainless steel “everyday” pan. It’s got a big flat surface for searing, sauteeing, and other dry cooking, while the straight sides give you plenty of interior volume for boiling and simmering. Just like other Viking pots, the inside walls have measuring marks so you know exactly how much liquid is inside of your pan. The downside here is that there’s no straight “pan” handle on this pan. Instead, it’s got the shorter square handles you see on stockpots. This makes tossing food around while you sautee a bit difficult. Since the smaller handles are closer to the hot pan body, it’s also harder to move around while you cook. Still, this is a great way to experience the quality and durability of Viking without having to get a (less durable) non-stick pan. 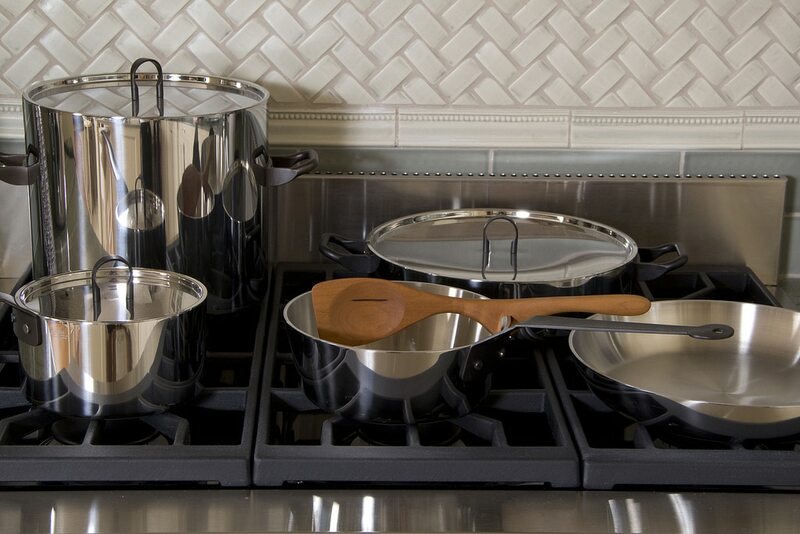 The stainless cooking surface will last just about forever, giving you plenty of time to see how you like the 5-ply professional line before buying a full cookware set. Viking has a pretty great selection when it comes to individual cookware pieces. This pasta pot is a great example of a well-chosen specialty piece. 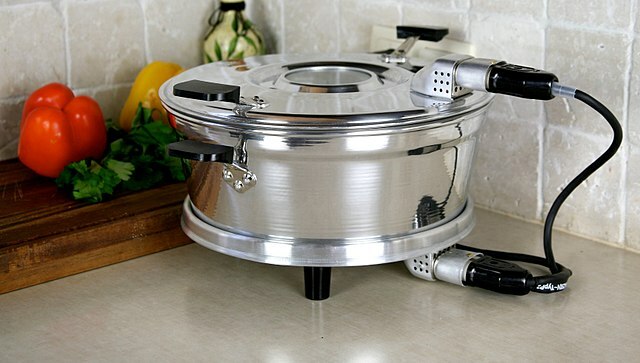 When you get this pot, not only do you get a big stock pot that’s perfect for pasta, potatoes, and other dishes, you also get a steamer and a pasta strainer to make cooking your favorite dishes a little bit easier. This pot comes in a 3-ply multi-clad style, meaning it’s incredibly durable and boils water a little bit faster than a 5-ply pot. 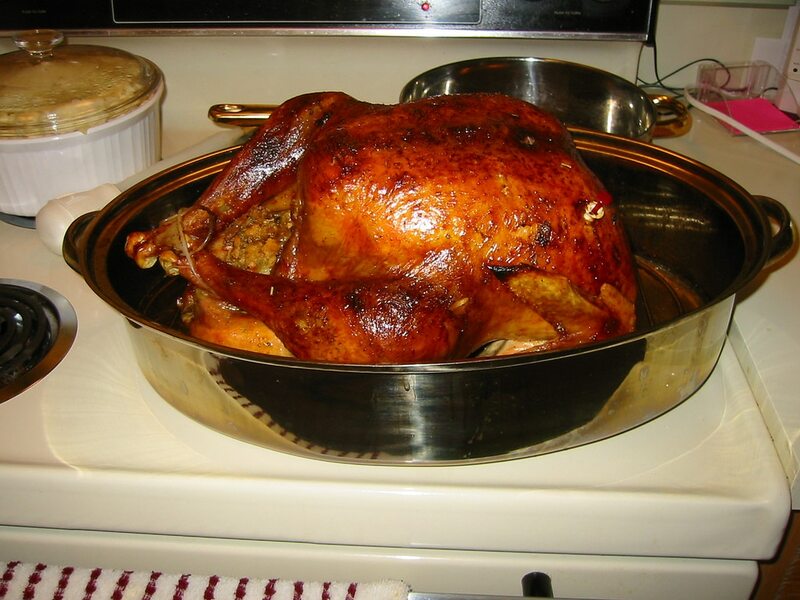 This roaster is another great example of well-crafted specialty cookware from Viking. It’s a 3-ply roasting pan with an included lid and wire rack, giving you the ability to turn your range into a slow-cooker at a moment’s notice. This is one of the best ways you can take advantage of induction’s fantastic heat control. Simply throw your favorite meat into the roaster, dial in the right temperature on your induction range, and let this roasitng pan do the heavy lifting. Finally, this 8-quart pressure cooker gives you a great blend of Viking durability with the reduced cooking times of a stovetop pressure cooker. It’s not quite as fancy as an electric unit with its own heat source, sure, but this induction-compatible pot is perfect for anyone who owns a range or hot plate. In addition to the normal set of pressure valves, controls, and indicators, you also get the same set of interior measuring marks as other Viking pots. This helps ensure that this pressure cooker is fantastically easy to use. If you’re looking for another option in multi-clad cookware, give Viking a go. Viking pots and pans are competitively priced against other midrange brands while offering a few extra features that make them a bit easier to use. Even if you decide to go with a Demeyere or All-Clad set for your day-to-day cooking, be sure to check out Viking’s incredible selection of more specialized pieces. You’ll love the way these carefully crafted tools simplify your cooking process.